I recently collaborated with Motif jewelry to curate a special jewelry collection that I wanted all of you to love. I carefully hand selected these pieces that I would personally want to buy, and wanted to present them to you all as a compilation of the favorite kind of accessories that I love to wear on a day-to-day basis. Really, this collection is about versatility, which always works best for the constantly busy woman these days. Our time is precious, and so are versatile jewelry pieces that can really bring an outfit together. The idea of versatility is encapsulated in the "Link to Each" ring, which looks like two rings but is really one, the Treasure House necklace, and the Secret Choker necklace, which both look like two separate necklaces, as well. Half of the collection is rose gold (my favorite), and the other half is yellow gold. As a Californian, I made the collection based in two different types of gold because I am from the GOLDEN STATE, after all! What I love most about this collection is that it can be worn with jeans and a tee shirt (my LA uniform... of course), or something a little more glam like a blush fur vest and heels. I love that each and every piece is unique, yet simple and wearable. Check out the entire collection below and when you've found your favorites you can shop them all directly here. Make sure you grab the pieces that you like, though... my shop comes down March 25th! I'm so proud to share all of these with you as it's been one of my favorite projects that I've worked on so far. Check all of the collection out below, and I can't wait to see which ones you'll choose as your favorites! Wearing "The Treasure House" necklace, from my collection with Motif here. -- The Colby Cuff Bracelet comes in gold, silver, or black. I love it for it's minimal lines and easy to close clasp. I hardly ever take mine off, an amazing every day piece that can go with almost any other of your favorite accessories. The Colby bracelet and pearls at hand ring, both in gold. --- This gorgeous ring with claw detailing and pearls looks great with The Treasure House necklace, because hello, pearls! I love that it's a statement ring without being too much. It's also on sale! Grab one before they're gone. --- There has been nothing more trendy and of the moment lately than chokers! For this one I love that there is a dainty rose gold component that is wrapped with black suede-like fabric that creates a bow. Again, it looks like two necklaces which I LOVE! I guess I'm kind of lazy, but the less I have to do to get my jewelry on in the morning, the better... am I right? --- Admittedly, I don't wear enough earrings. That being said, when I see ones that I love I know I just HAVE to have them. These earrings are one of my favorites from the entire collection and a surefire compliment getter. Wear them with an off the shoulder dress this Spring for some serious va-va-voom. These are also silver plated with rose gold so they won't irritate your ears! The Swing in the Wind earrings, and the Secret Choker necklace, both in my jewelry collection with Motif.me, here. --- I've saved the best for last. There's just something about this ring that is perfect for a little glitz in the right places. I hardly ever take it off since it came home with me. I find myself wearing it with a sweater and jeans, but also the first thing I reach for when I need to dress up a pantsuit or something more night time. 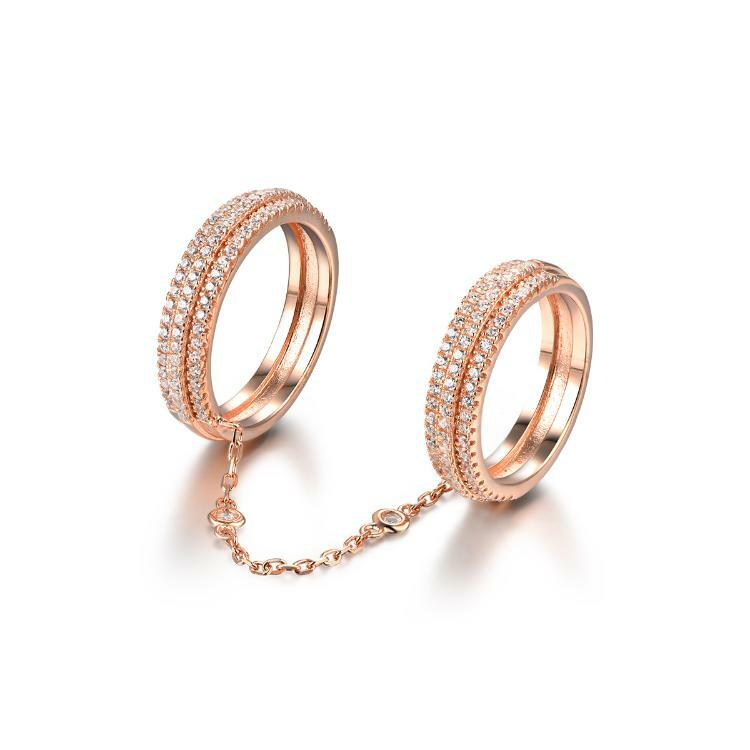 Again with the two for one, it's one ring connected with a chain so it gives you the perfect stacked look as a midi and regular ring with the ease of having just one piece. Thank you for checking out the collection, I hope you got to score a couple pieces for yourself! Let me know which are your favorites in the comments below, and thank you to all who have supported the collection so far! It seriously means so much to me to hear all of your positive feedback! All photos in this post courtesy of Brian Gove, all rights reserved The Style Sauce 2017.